The EggBot is a compact, easy to use open-source art robot that can draw on spherical or egg-shaped objects. Super adjustable; designed to draw on all kinds of things that are normally “impossible” to print on. Not just eggs but golf balls, light bulbs, mini pumpkins, and even things like wine glasses — with a bit of work. Use it to personalize Christmas ornaments or impress your friends with masterpiece Easter eggs. 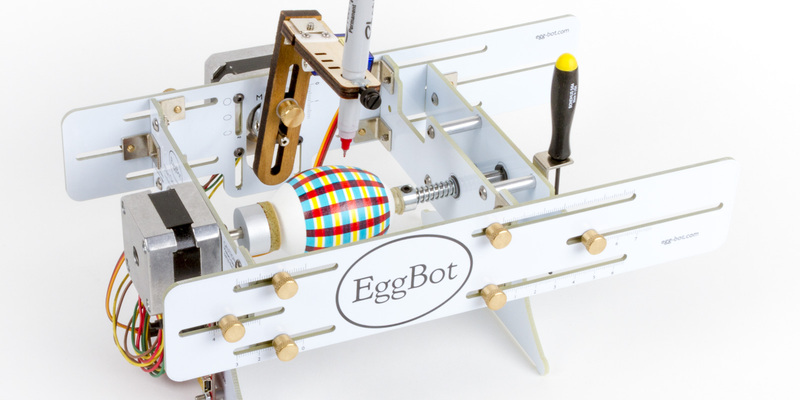 The EggBot is not just a cool gadget; it’s also a great introduction to CNC (computer numerical control) and do-it-yourself robotics. All of the electronics and software are designed to be hackable and repurposable, so you could easily computer control an Etch-a-Sketch or create something totally new. The EggBot software allows you to control the ‘bot from within Inkscape — a superb freeware illustration program — on Mac, Windows, or Linux computers. You can draw an image directly, trace a photograph, or import designs from other programs. You can also control the EggBot directly from many other programs that have the ability to send serial commands over a USB port. Using our optional electro-kistka (hot wax dispenser) accessory, you can even create traditional decorated eggs using the wax-resist and dye method. There is also an available diamond engraving tool that can etch and engrave hard materials like glass and stone. EggBot kits start at $195. The kits are recommended for ages 10 and up; under 13, adult supervision is recommended.